Experiment with a variety of techniques to make a textural pictorial or abstract piece of felt. Use from a wide selection of supplied wool, plant and silk fibres. Mix different colours of wools and fibres together using carders. Embed textural yarns and different types of fabrics into the felted surface to create texture and form. 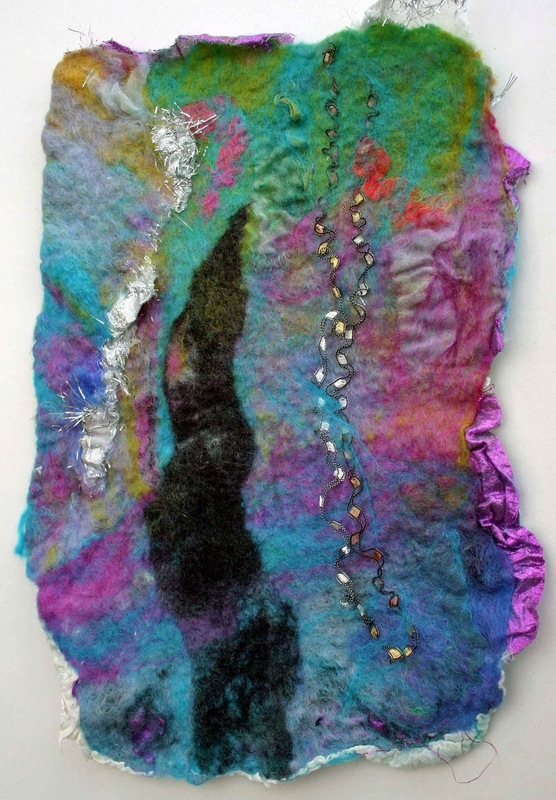 Instructor Bio: Josephine is a fibre and mixed media artist specialising in the ancient art of felt making by manipulation and transformation of dyed wools and other natural fibres. Contemporary wall hangings, box framed and freestanding sculptural works, many of these explore a rich palette of colours, including complementary and contrasting purples, pinks turquoise and oranges. Jo runs regular felt/fibre nuno and needle felting workshops.